The city of Brussels is on lockdown following three explosions Monday morning - two at Brussels airport and one at a city Metro station. Security has been tightened across the EU in response to the blasts. Belgium raised its terrorism alert to level four, its highest level, for the first time ever and declared three days of national mourning. Following reports of the first incident at Zaventem Airport and its subsequent evacuation, city authorities issued an alert asking people to stay away from the scene. Flights to and from the airport have been suspended, the airport will remain closed until at least Thursday, and air traffic will be closed until at least noon (12pm) on Wednesday. Less than an hour later, explosions rocked the city’s Maalbeeck Metro station, located close to EU buildings. Between the two incidents over 30 people have been reported killed and some 230 people injured. Limited bus lines have started operating again and Metro lines 2 and 6 are active, the rest of the Metro services are still closed. Eurostar are looking to open some services to Brussels Midi by this evening. Belgian authorities initially asked schoolchildren to remain inside their schools, but that warning has been lifted in the last hour. EU institutions asked staff to either stay at home, or to stay in their offices and all meetings have been cancelled. 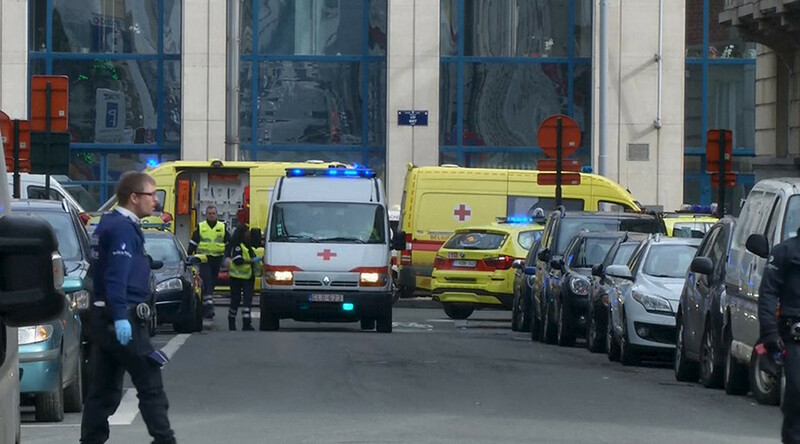 Demand on communications systems in Brussels has caused some problems, leading the city’s emergency response organization to appeal for people to contact it directly by social media or text for information and advice, rather than attempting to phone. Security at travel hubs around Europe has been stepped up following the explosions in Brussels. Immediately after news of the explosions broke, Frankfurt, Paris and the Netherlands increased their airport and border security, and delays are expected at all airports. In Britain, the Met's counter-terrorism chief has issued a statement saying that although British authorities believe an attack there is unlikely, security at "key locations" is being bolstered in response to the Brussels incidents. 1/2 As a result of the terrible incidents in Brussels, there will be increased police and security patrols in and around Gatwick Airport. “As a precaution forces across the UK have increased policing presence at key locations, including transport hubs, to protect the public and provide reassurance," Met Assistant Commissioner Mark Rowley said. "This is not in relation to any specific information or intelligence." “We are in close liaison with the Belgium authorities and will continue to monitor the situation. Security has been tightened at Dover Port and other ports in Britain as a precaution. British Prime Minister, David Cameron said he will hold a special Cabinet Office Briefing Room meeting today to discuss the attacks. PM: I will be chairing a COBRA meeting on the events in Brussels later this morning. Authorities in Delhi, India have also increased security at their city’s airport in response to the Brussels attacks. Security has been reinforced in #Paris at train stations, in métro, and airports (AFP). Same for Frankfurt and London Heathrow airports.